Young couple attacked in Rietfontein by two houserobbers, black males – home-owner shoots one man to stop him from assaulting his girlfriend. The second suspect ran away and was arrested shortly thereafter a block away from the crime scene. Emergency services at the scene were photographed stabilising the injured man, who was shot in the head. 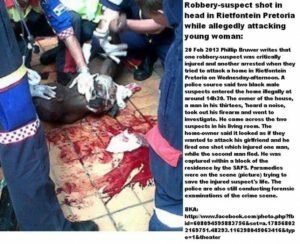 Rietfontein suspected house-robber shot in head, allegedly was assaulting young woman this afternoon.